Seeing as there is nothing in this topic, and most cases fall under this category, I figured I would start the CASE GALLERY! 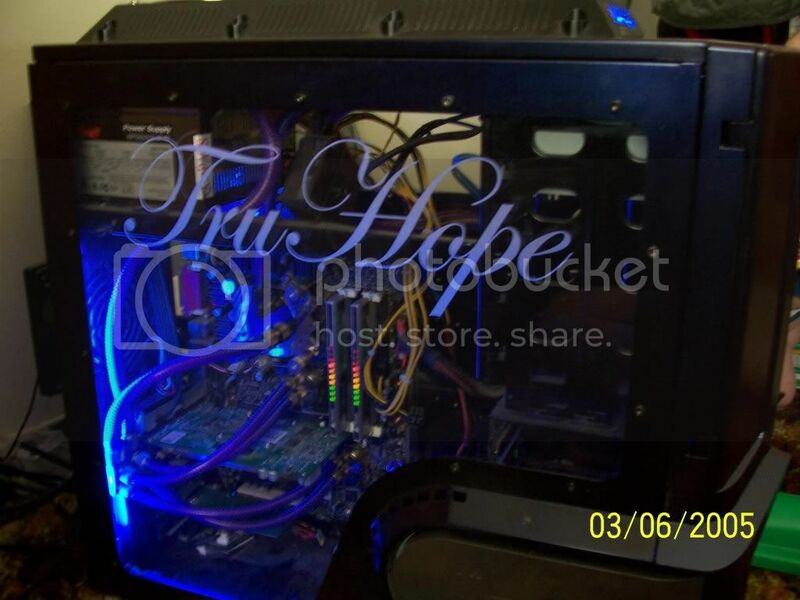 Post your custom modded cases featuring Koolance Gear. Show us what you got and what you can MOD! Please try to keep pictures of an adequate size and to post an adequate number of pictures. Too many per poster can really clog up the thread. Very nice, I saw that build log a couple days ago and especially liked the packard in the background =P. this is my previous system working a new one now though. Here is my System! 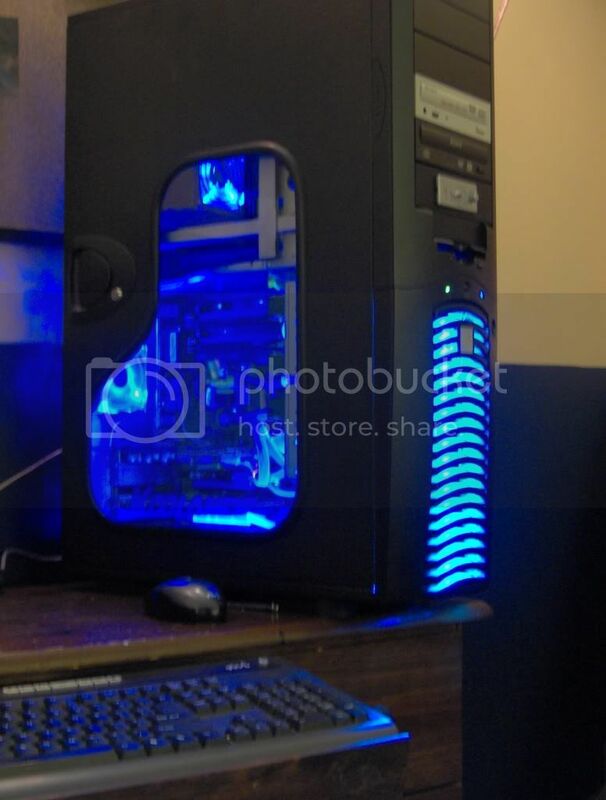 Lian Li Case Older PC-75B with Koolance Drop in Kit. Koolance cpu-340 on my E8400 oc to 4.8. 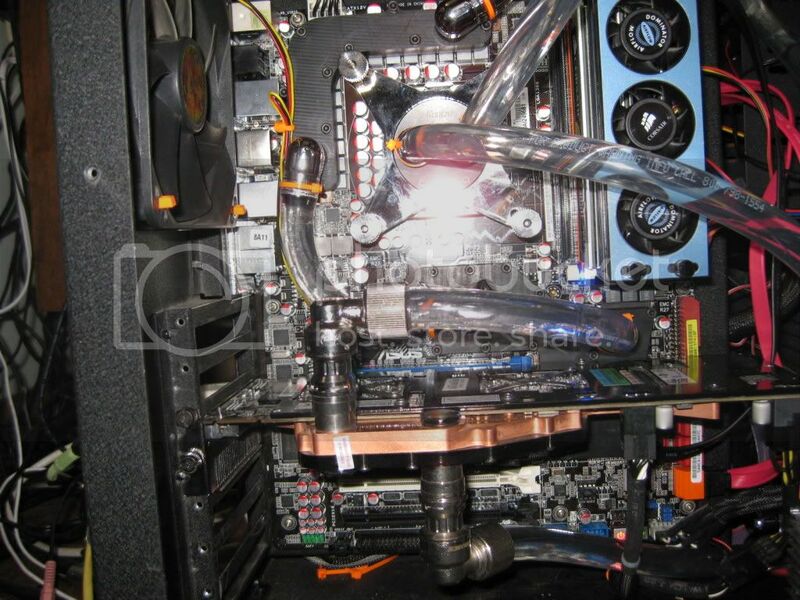 The video card is an EVGA 9800 GX2 with EK Water Block, this is on the koolance loop green liquid. 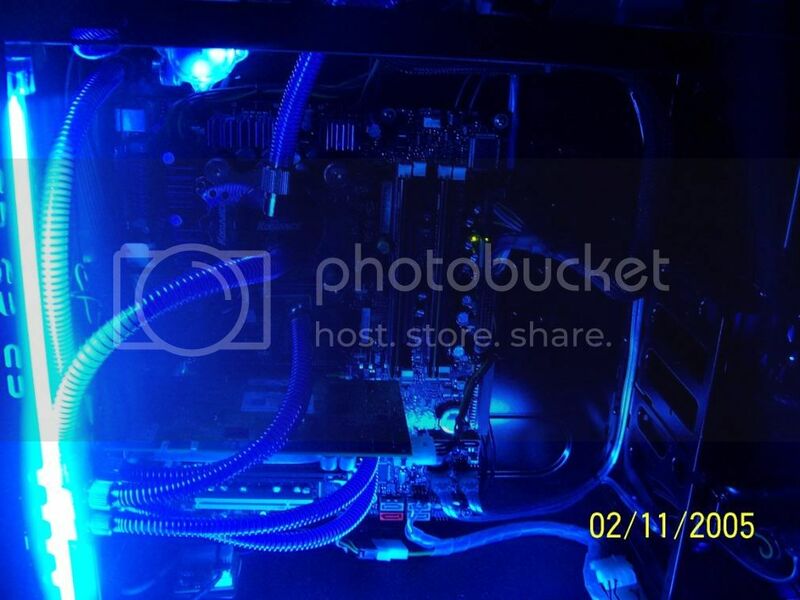 The Motherboard is an Asus Stiker 2 Formula with EK Water Blocks on a separate system than the cpu and gpu, and is blue liquid. 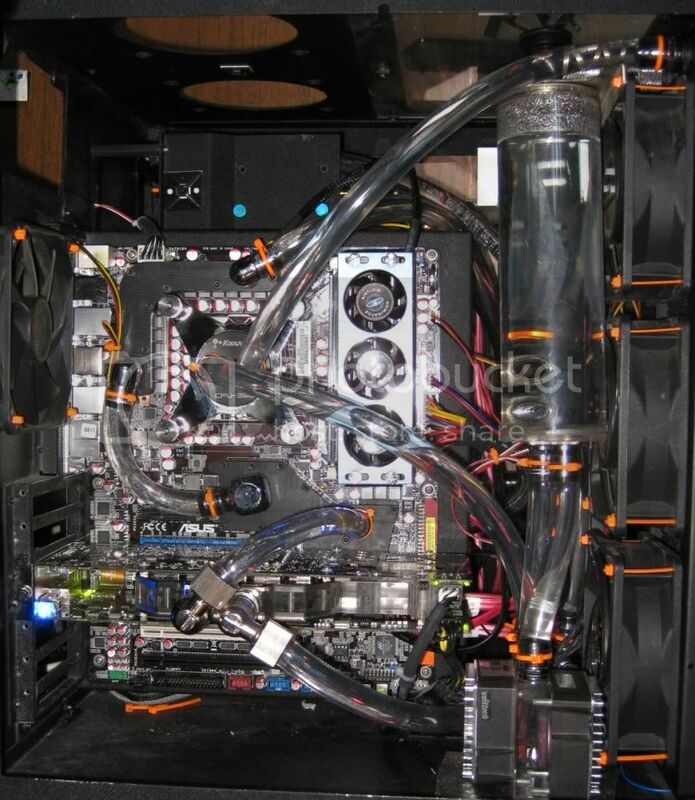 jad3f1r3 wrote: Here is my System! 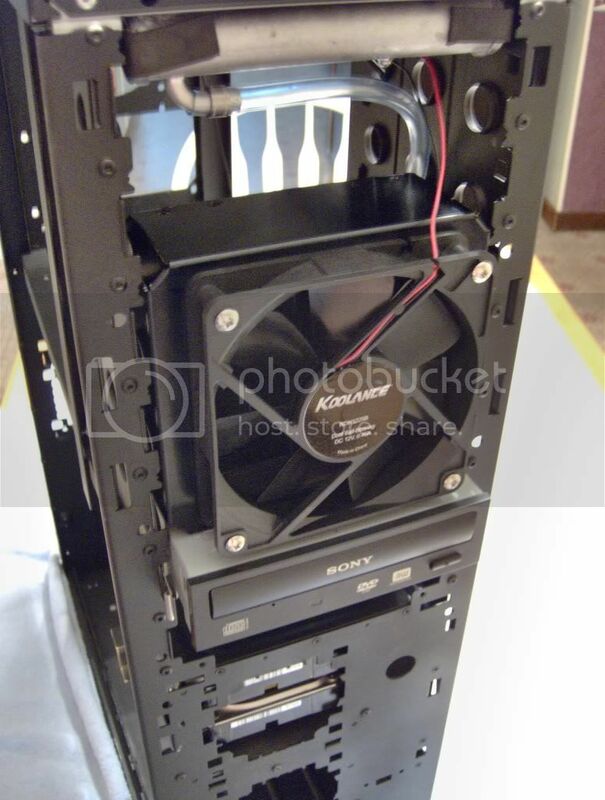 Lian Li Case Older PC-75B with Koolance Drop in Kit. 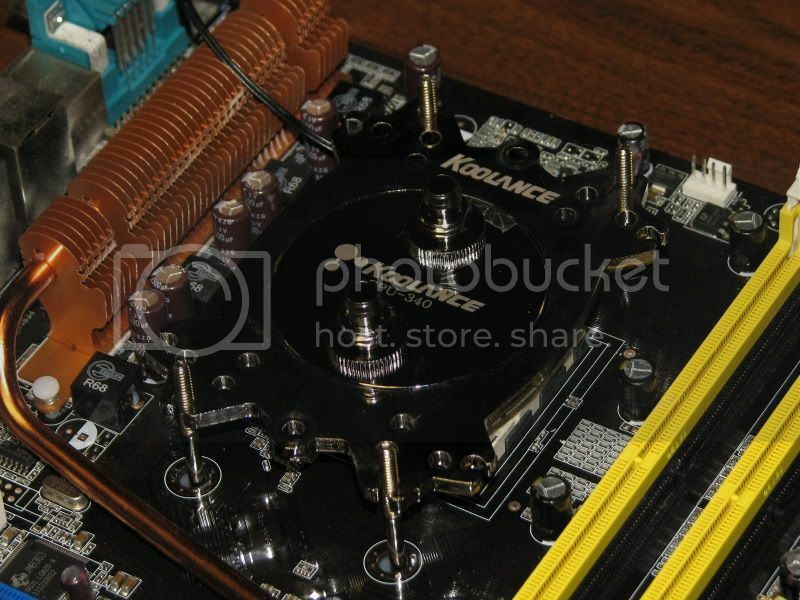 Koolance cpu-340 on my E8400 oc to 4.8. 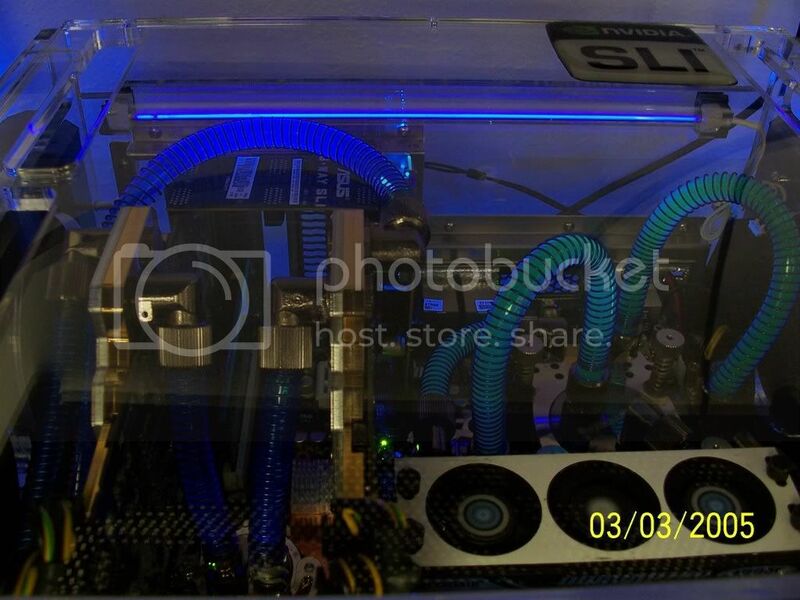 The video card is an EVGA 9800 GX2 with EK Water Block, this is on the koolance loop green liquid. 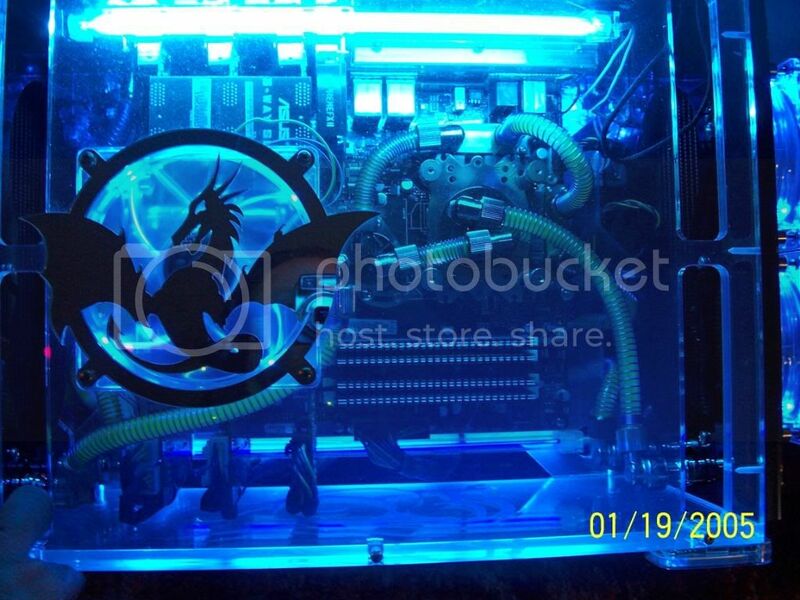 The Motherboard is an Asus Stiker 2 Formula with EK Water Blocks on a separate system than the cpu and gpu, and is blue liquid. Upload a bigger picture chief. Last edited by Superman on Mon Nov 09, 2009 10:45 pm, edited 1 time in total. I have a few builds so ill just link each seprate build. Told ya it was ugly! and yet again there will be 2 more new ones here in the next few months. 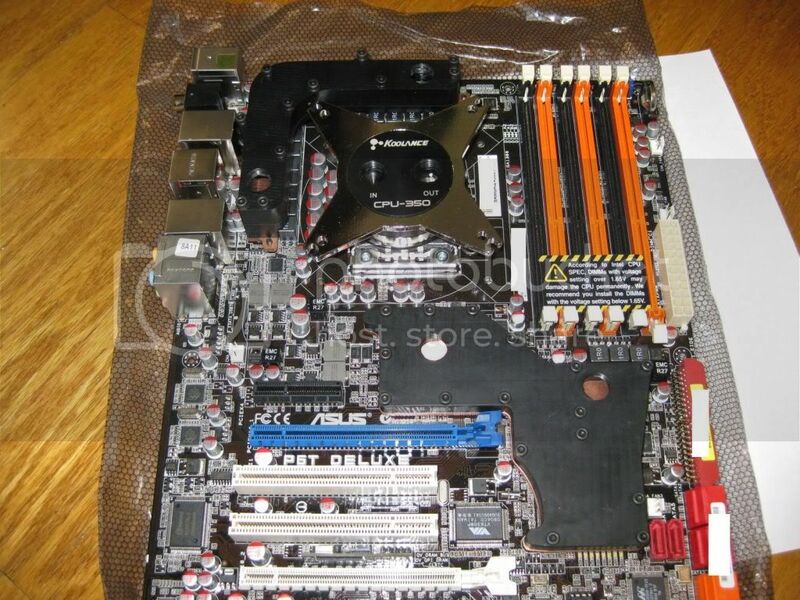 These are not the best pictures, things are a bit dusty and messy. And the face plate for the hidden dvd-burner fell off. Haven't had time to re-attach it properly. 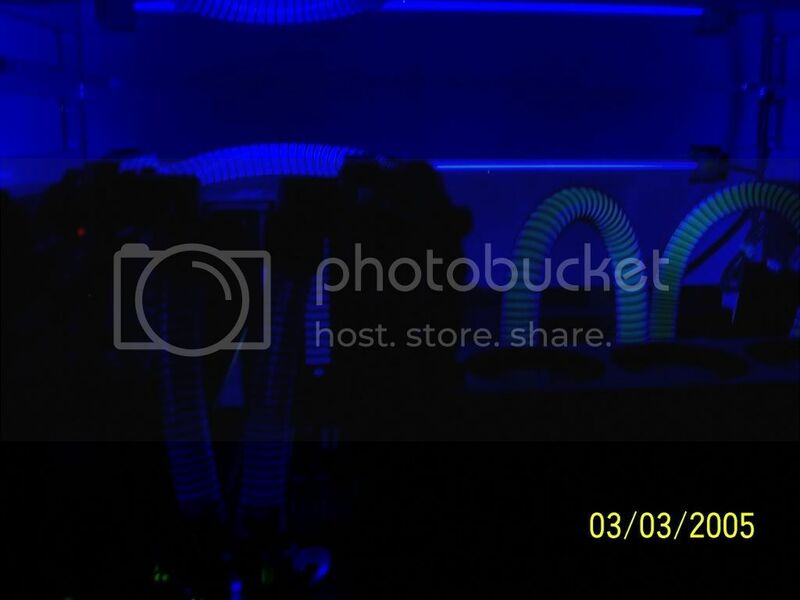 The UV effects don't' show very well but there are 4 AC Ryan dual over boosts for the UV. And the window is a 2-way mirror so it prevents a crisp image. I took out the front plastic grill vent thingy. And replaced it with a a mesh. Inside i cut out some of the excess metal between the hard drives and the new fans. Completely removed the 80mm mountings in the hard drive cages, better airflow from the larger fans that way and due to the case's short depth and everything inside gave me a bit more clearance behind the hard drives from being able to move them forward. The 5.25 thing right above the x-fi breakout box is Sunbeam Light bus. Actually works pretty well for controlling everything that I typically have hooked up. The 4 buttons on in the 3.5 drive space. 2 are dvd-roms, and the other 2 controls ram led's. However moving to dominator ram i ditched them. Bottom rad in this picture is part of the KIT-1000 i purchased. The one that came with the enclosure and the mounting to mount it externally. 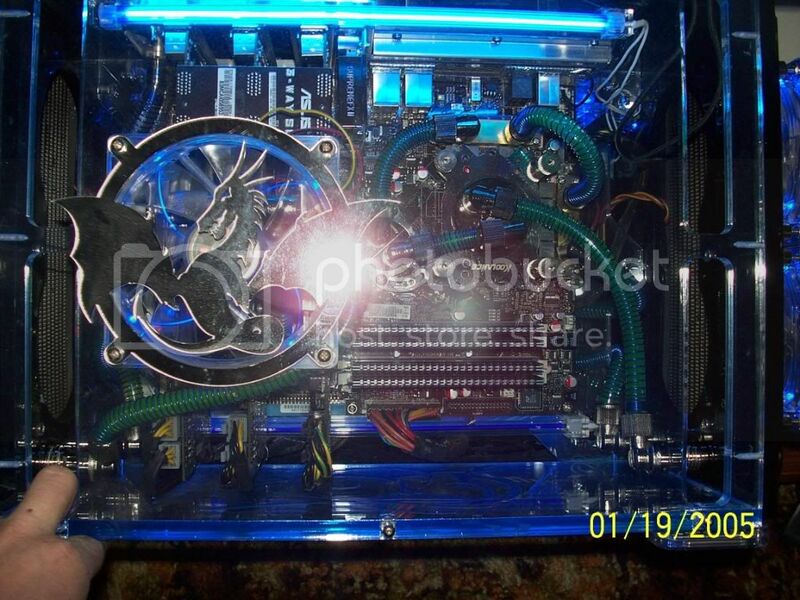 Top is the 1.2KW Koolance PSU. Trying to show that the ac ryan's are bright, they actually make the external hosing glow as well. 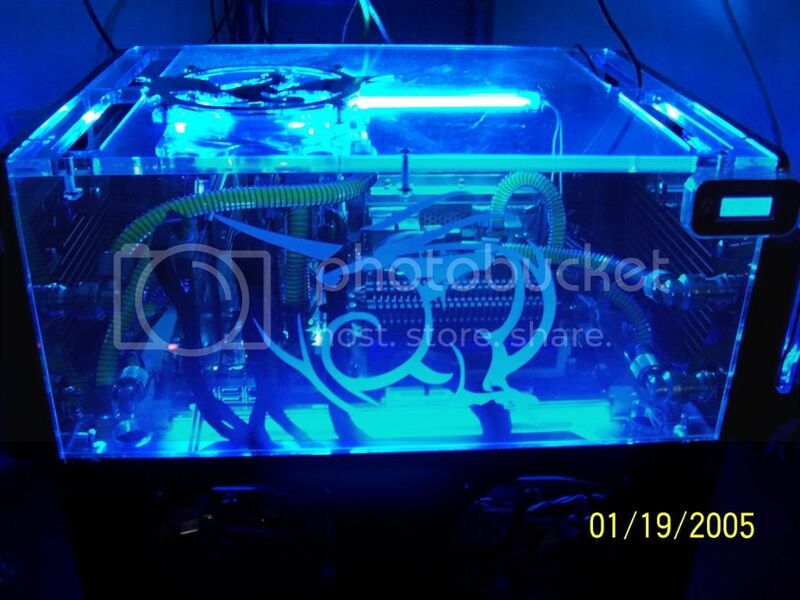 It's Feser black UV and as mentioned before the camera doesn't pickup the UV all that well. There is a 30 led, led strip right below the window. There was 2x30red and 2x30green however had issues with the glue holding where i placed them so removed them for the time being. 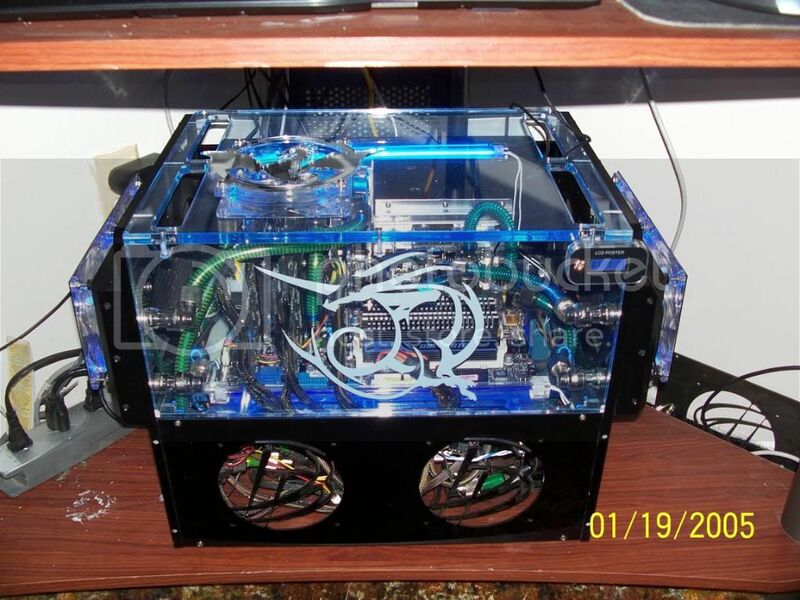 Great looking Rigs you all have there! 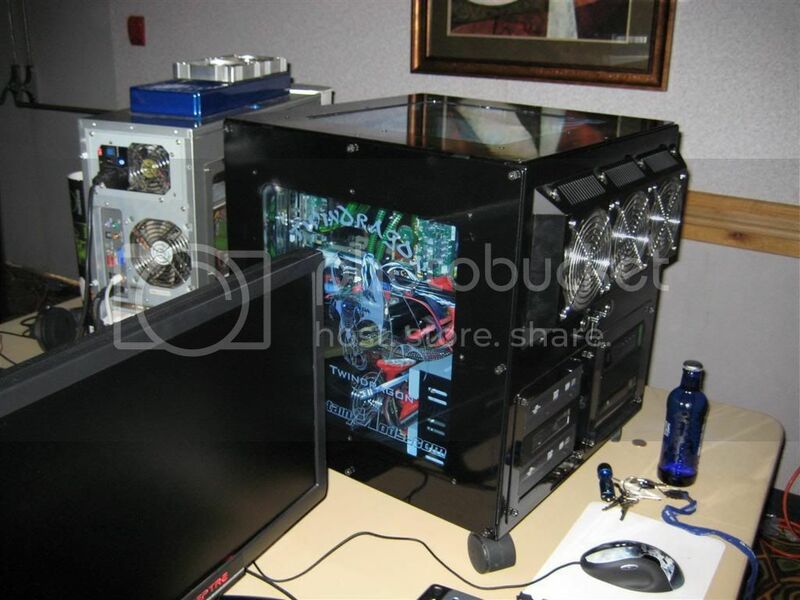 oh you guys want to see my rig. i'll have one of xfire up soon.